While the quarter pictured in the above photo is not valuable, the ones listed below are worth a whole lot more. Today, the quarter dollar coin is the workhorse of the United States economy when it comes to making change. If you want to own one of these valuable quarter dollars, you will need a lot more than small change to purchase one. Every modern Proof coin has extremely frosted devices, deep mirrored fields and is made by the millions for any coin collector that wants one. However, 200 years ago Proof coins were made to-order for coin collectors that wanted to acquire one for their collection. In 1834, only ten Proof quarters were made. To find one with a cameo contrast makes the coin even more attractive to rare coin collectors. Christian Gobrecht designed the Liberty Seated quarter, and the United States Mint first produced them in 1838. All Proof coins receive special handling and attention to ensure a coin of the highest quality is produced. Over the years this Proof coin has obtained a beautiful metallic blue color over the entire obverse. Coupled with the fact that the mint produced only four of these coins in Proof finish, makes this beautiful coin extremely rare and desirable by collectors of classic United States coins. The United States Mint first minted quarters in 1796. Quarters were not minted again until 1804 with an extremely small mintage of only 6,738 coins produced. Experts estimate that less than 200 coins of the original mintage exist today and less than five coins remain in original mint state condition. And out of that handful of uncirculated mint state coins, this is the finest example of an 1804 Draped Bust quarter in existence today. The Carson City branch of the United States Mint opened in 1870 with the purpose of turning the glut of silver on the West Coast into United States coins. During this time, the West was wild and coins from the Carson City mint produced during this period have a certain allure to coin collectors. From an extremely small mintage of only 8,340 coins, experts estimate that only three survive in mint state condition. Since this coin is one of the finest, it commands such a high price. The United States Mint in the early 1800s was a very labor-intensive operation. Skilled artisans produced the coin dies by hand. To increase efficiency and provide a level of design consistency, the artisans punched the letters and numbers into the coin die by hand. The engraver making this die originally punched "50 C." into the coin die thinking it was a half dollar coin. When he realized his mistake, he tried to cover it up and punched the proper denomination of "25 C." into the coin die. You can see the remnants of his mistake underneath the denomination on the reverse of the coin. When Christian Gobrecht first designed his Liberty Seated quarter in 1838, there was no ornamental drapery extending from Lady Liberty's left arm. Approximately halfway through 1840, drapery was added to extend below her arm. Therefore, there are two varieties of the Liberty Seated quarter. Since Proof coins were made to order at the request of coin collectors, the quantity of Proof coins minted from year-to-year varied. In 1838 there is only one known Proof Liberty Seated quarter. This unique specimen commands it's extremely high price. Here is another unique coin from the early 1800s. This 1823 Proof Capped Bust quarter has a re-punched date or overdate. It is not clear if an engraver at the United States Mint was trying to correct an error or reuse a coin die from the previous year. Regardless, there was only one Proof quarter made in 1823 and to own this coin will require a large expenditure when it comes to the auction block again. 1805 was only the third year that the United States Mint made quarters. 1796 and 1804 had mintages of approximately 6,000 pieces each. In 1805, the mint made over 120,000 pieces. An intermediate collector can afford one of these coins in a lower grade. However, this specimen has original mint luster that is deep and rich. Luster this beautiful is rarely seen on early coins from the United States Mint. Coupled with its pristine condition, it drives its value close to half a million dollars. By 1807, the mint was approaching production mintages close to 250,000 quarters. In and of itself, this coin is not rare. But NGC has certified it as a high-end MS-66. This lofty grade makes it the finest known 1807 Draped Bust quarter. Additionally, this coin is pedigreed to the Eric P. Newman coin collection. Newman was a top numismatic researcher and collector until he passed away at 106 years old in 2017. The United States Mint continued to make Proof coins for collectors upon request into the 1850s. This 1850 Proof Liberty Seated quarter is one of only three Proof quarters made that year. In addition to being extremely rare and desirable, this coin is almost flawless as indicated by its PR-68 grade. The Liberty Seated quarter series is very popular amongst collectors, and any specialist would love to add this coin to their collection. In 1873, The United States Mint coined well over a million quarters at its Carson City, Nevada facility. All of these quarters had an arrowhead on each side of the date except five of them. The arrows were added to the design to denote a change in the weight of the coin from 6.22 to 6.25 grams. The romance and allure of owning a coin from Carson City, combined with its extreme rarity, drives the value of this coin to new heights. Here is another example of an extremely rare Proof Liberty Seated quarter. This 1839 example is lacking the ornamental drapery underneath Lady Liberty's left arm. It's mirror-like fields, and steel blue toning gives this Proof coin an exceedingly stunning eye appeal. Advanced quarter collectors will need to pay well over half a million dollars the next time this coin comes to auction if they want to add it to their collection. The 1901-S Barber quarter is rare and expensive in any grade. When Superior Galleries sold this coin in May 1990, certified coins were not as popular as they are today. Therefore, we can only estimate the grade that it would receive today if it were certified. 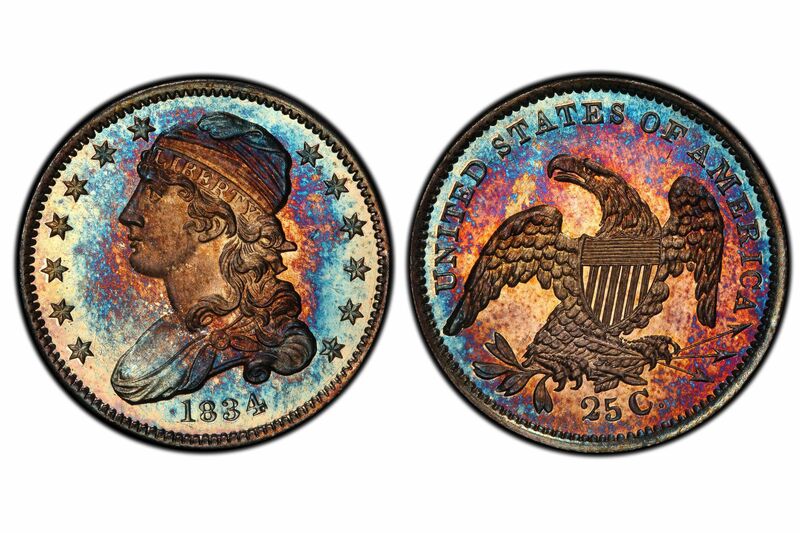 Regardless, this beautiful and almost flawless coin sold for a record-setting $550,000. Here is another example of a coin with an over date. The mint in Philadelphia used the original die to produce the entire run of 1823 quarters. This die was an overdate, and itself is a leftover coin die from 1822. Mint workers modified the die by punching a numeral 7 over the last the last digit which was previously re-punched with a numeral 3. The mirrored field and frosted cameo devices give this coin an outstanding eye appeal which pushes its value to close to three-quarters of a million dollars. The Mint Act of April 2, 1792, specified five silver denominations: half dimes, dimes, quarters, half dollars, and silver dollars. However, it wasn't until 1796 that the United States Mint first produced quarters. 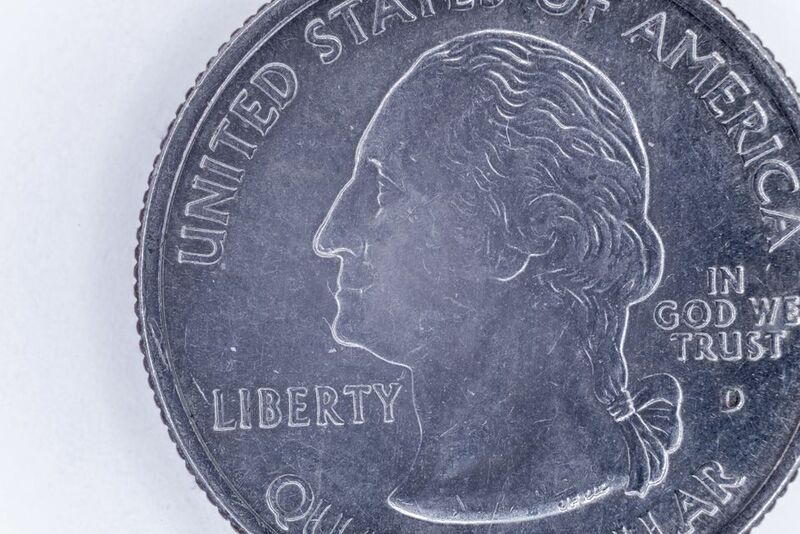 Experts estimate that less than 700 examples of the first U.S. quarter exist today. Minting technology employed in the late 1700s resulted in a lack of quality and consistency. Workers at the mint operated the coin presses by hand, and striking pressure varied from coin to coin. This specimen of a 1796 Draped Bust quarter is highly unusual in that it exhibits fine details that could only be produced by a pair of fresh coin dies and extremely high striking pressure. Additionally, it has been well preserved and protected for over 200 years. This coin's high quality striking and pristine condition makes it the most valuable United States quarter!